Please provide below specifications details. The Holder With Brush is very important to the life and operating efficiency of the brush and also to the parent machine. 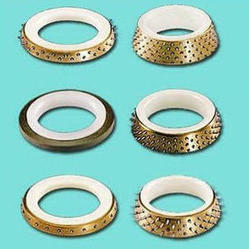 The quality of the brush performance is always dependent on the design and ability of the Brush Holder which supports it against the commutator or slip ring. We can supply Heald Wire for weaving machines in all sizes. Our Heald Wires are made from excellent quality raw materials. These Heald Wire are widely appreciated by our customers for its quality and it can be availed at most competitive price. We offer a wide range of Weaving Machine Parts for Picanol machines that are extremely durable and efficient in their operational area. We use sturdy raw material to manufacture these products. They are made using precision engineering techniques and are mainly used to produce Rapier, Airjet and Terry looms. With sincere intentions to preserve and uplift our reputation in the industry, we are manufacturing a comprehensive assortment of Forked Link. - Used as a part in projectile machine. - Tapes, Wheels, Blue Belts etc. Automatic travelling cleaner for weaving machines.